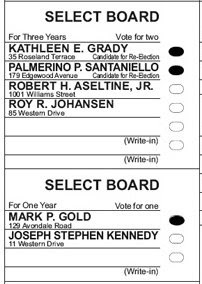 This will be a very important town election for Longmeadow. The voters of Longmeadow will be electing the leadership for the executive branch of our town government. They will be choosing 3 of the 5 members of the Select Board. In addition, there will be the election of a new member of the Longmeadow School Committee. If you have been reading the "Buzz", you know that the financial crisis that has affected the rest of the world has had a direct impact on Longmeadow. The town's revenue sources have decreased significantly while at the same time the cost of operating our schools and delivering town services have increased. In addition, the town infrastructure including our schools, DPW facility and equipment, water/sewer systems, etc. are in critical need of repair or replacement. There will be important choices to be made and we will be electing three people who will be key players in the decision making. Below are my choices for election day. You may not agree with some or all of them.... all I ask is for you to be an informed voter and get out to vote next Tuesday, June 9! Our town needs balanced leadership! If you haven't been reading the LongmeadowBuzz blog and following the uncertainties of our town finances, please wake up before it is too late! There are likely to be some significant shortfalls in town revenues for both the current FY2009 and FY2010. With the expiration of teacher and town employee contracts and no provision for "cost of living" adjustments in the FY2010 budget, the town will likely be dipping into the Operational Stabilization Fund or "rainy day" fund to balance the FY2010 budget. Because of continuing fiscal problems, there will be a continuing need for elimination/ reduction of additional non-essential town-wide services. Longmeadow has done a significant amount of this in the past (curbside leaf collection, reduced curbside trash, increased High School sports user fees, etc.). There have been recent rumors of closing/relocation of the Greenwood Park/Senior Center as one of the next steps to reduce our spending. In addition, the School Building Committee is moving on a timeline that may be putting a decision to build a new high school (price tag ~ $50-100 million) on the warrant for next year's annual town meeting. If I had to personally prioritize town services, I would say that schools are very important but certainly don't rank at the top of the list.... I would rank public safety, fire, police, water supply, sewer and storm drainage before schools. Recent maintenance experience and surveys have shown that our town infrastructure and equipment are in desperate need of repair. You as a homeowner only need to experience a sewer backup or storm drain overflow into your basement one time before you put these services at the top of your personal list. 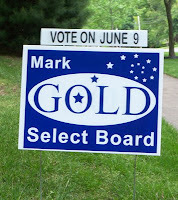 Election day is next Tuesday, June 9 with three of the Select Board seats being contested . There are two different Select Board elections- four candidates are running for two "three year" seats and two candidates are running for the "one year" seat (vacated by Brian Ashe). Make sure that you vote for three candidates. 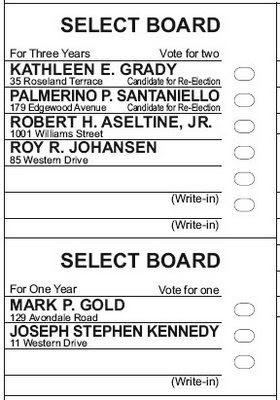 There is also a contest for one school committee seat (one year) with two candidates running. Two other incumbent candidates are running unopposed for the two "three year" seats . There are a number of other uncontested elections. Here is a link to a complete election ballot. The next 3-5 years are critical for Longmeadow if we are going to preserve the quality of life that many of us have come to expect. The Select Board race will elect 3 of 5 members- each of whom will play an important role in shaping our town's future. When deciding how to vote, please consider the team makeup of the SelectBoard. It appears obvious that there are polarizing elements in our town that would place schools above all else. We should elect candidates that will bring balance between schools and town services into planning for the future. If you are going to be out of town and not able to vote on Election Day, pick up an absentee ballot at Town Hall. The deadline for filing absentee ballots is June 8 at 12 noon at the Town Clerk's office in Town Hall. For additional information about absentee ballots, please visit the Town Clerk's Voter Info webpage. Make sure you get out to vote on election day- June 9.... As we have seen in recent close elections, your vote does count.